As you might know, I've been writing a column called 25+ for the South China Morning Post's 48 Hours Magazine for a while now. The column features one restaurant a week that's over 25 years old. Basically I go in and ask old-timers (where possible), or second, third generation operators about the past, present and maybe future of the restaurant. The column is pretty short, and sometimes I get really interesting stories and details from the interviewees that won't all fit into the column, so I thought I'd share my notes here, instead of having them sit in my notebook as illegible scribbles... Hope you enjoy them as much I enjoy speaking to these folks. I'm filing these posts under 25 Plus Plus. This is an extension of the 25+ column about Cheung Hing Coffee Shop. 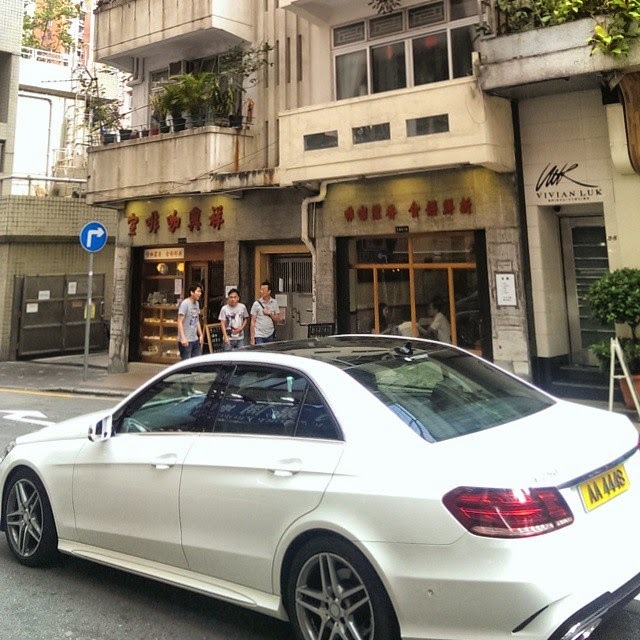 The lovely refurbished Cheung Hing Coffee Shop, on the ground floor of a beautiful building built in 1950; expensive car illegally parked outside. So Hong Kong. Just a couple of years ago, Cheung Hing Coffee Shop 祥興咖啡室 was a rundown cha chaan teng that people wanted to love but just couldn't, because the food was awful and the place was falling apart. When I called to schedule an interview, the lady in charge wanted to make sure I knew it was under new ownership now - indeed I did, and I was desperate to know the story. Some of my favourite stories for 25+ have been small businesses taken over by people with a vision - it's heartening to know that Hong Kong's heritage will not die out completely in my lifetime. The space is now very pleasant. Gone are the sad fluoro lights, flickering from disrepair, the mouldy benches, the bad baked goods, the weird aroma cocktail of of dust, grease and stuffiness. The current owner James was in the retail business - not food - and with a few business partners, decided to take over the cha chaan teng when the previous owners were about to give it up. The previous owners were getting too old and unable to keep the place running smoothly. Their baker had retired a few years back, and they never hired a new one - instead they had just bought bread from a distributor. A far cry from what's available now - beautiful egg tarts, pineapple buns and more, all made in-house. The building is one of the few 1950s walk-ups still standing and well-maintained. James tells me it's because the whole building is owned by one owner, an elderly lady approaching her centenary. When the previous Cheung Hing closed, both James and his partners and a Japanese restaurant wanted to take over the space, and the lady, having been around during the Japanese occupation of Hong Kong, wasn't so keen on the latter proposal, and asked James to hurry and make a decision. I have nothing against Japanese restaurants, but I'm glad Cheung Hing is back, proudly not-new, and improved. James asked if I knew San Hang Yuen 新香園 in Sham Shui Po (why, indeed I do) and told me that he's friends with Isaac, the second generation operator there (who's known for his previous career on TVB's kids's shows). Isaac and his father-in-law helped James and his team initially with the relaunching of Cheung Hing, even supplying them with their own blend of tea leaves, but that's no longer the case. James says Tsit Wing, major supplier of most tea and coffee in Hong Kong's local restaurants, approached them and offered to make them a custom blend. He says that for TW, it wasn't about the money, it was about supplying an old, iconic cha chaan teng like theirs, plus it means that he didn't need to drive to Sham Shui Po every couple of days to pick up tea leaves. In 25+ I quoted James saying that their pineapple bun is on par with the best in town - an example he gave was Kam Fung in Mong Kok, just so you know. The menu isn't huge like Tsui Wah - and James continuously reminded me during our interview how he wishes the evolution of cha chaan teng culture did not just go in the direction of Tsui Wah - but it includes some highlights like corned beef and egg toastie, courtesy of San Hang Yuen, macaroni in tomato broth a la Sing Heung Yuen, and beef brisket, which was a proud addition made by the previous bosslady of Cheung Hing. Cheung Hing had gone through three separate owners, not passed down the generations, but sold each time. Even though there were no bloodlines involved, the heritage of the place is still very much respected. During the years I lived in Happy Valley I rarely visited Cheung Hing, choosing instead to patronize Sun Cheung Hing ("new" Cheung Hing) instead. I love corned beef and egg sandwiches, and for some reason Cheung Hing did not serve it. I was sad to see Sun Cheung Hing close down, and the name was revived by another operating doing something totally different and disappointing. I am glad to see that the revival of Cheung Hing looks much more promising.